Sailing adventures and excursions on the Schooner Mycia are offered by exclusive agreement with Captain John Maher and Captain Darcey Maher. Contact us to discuss ideas for extraordinary travel in the Pacific Northwest and Alaska. 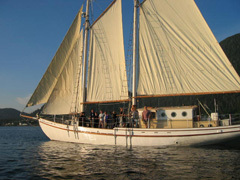 Create some of the best memories of your life aboard the Schooner Mycia! Thank you for visiting our web site. We're looking forward to sailing with you!